Searching for "cookie jar metaphor" on Google you will find the well known "hand in the cookie jar" one, so coming up with a new metaphor that relies on the same concept might sound pretty ambitious... However, it came to my mind like this and I do not want to change it, no matter if it will be drowned in an ocean of unrelated information. The thing is: suppose I have been using a cookie jar to save my money for a while and now I have collected a rather good amount of it. One day I decide I want to give my money to those people who really need it and start sharing the contents of my cookie jar, so I open it, I put it on the table in my kitchen, I put a sign next to it saying "Free money, take as much as you need", then I leave my door unlocked so anyone could enter and get that money. Would that money be really shared with others? Would that be shared with others who need it? I have been writing free code basically since I write code. Every time I released a new piece of software (well, usually not amazing apps) I uploaded it somewhere and put a link on my website. Well, for a while my website has been a hacker's challenge closed to search engines and most of Internet users :-), but apart from that I have tried nevertheless to share my discoveries in one way or another. When I started to do research, I tried to do the same with my discoveries, tools, and datasets. I actually had a chance to share some of my stuff with some people and every time it has been a win-win situation, as I learned from others at least as much as they did from me. What I have learned, however, is that most of the time I have just opened my cookie jar on the table, not being able to reach many people outside, and most of all not being able to reach the ones who might have been more interested in what I was doing. I always thought that pushing too much my discoveries and accomplishments was more like showing off rather than sharing what I did, and supposed that if anyone was interested in the same things then they would have probably found my work anyway. Well, I guess I was SO wrong about this. Telling people around that I have that open cookie jar is my duty if what I want to do is share the money I have collected in it. So I think that this kind of communication becomes part of free software as much as writing code, and part of research as much as studying others' work and writing papers about yours. So now here's the problem: how to share my stuff more effectively? I guess being more active within specific communities (those who might get the best out of what I share), using other channels to communicate (i.e. I sometimes twit about my blog updates, I guess I'll do that more often - do you have #hashtags to suggest? ), but most of all finding the time to do all of this. This is one of the very first tools I have developed in my first year of post-doc. It took a while to publish it as it was not clear what I could disclose of the project that was funding me. Now the project has ended and, after more than one year, the funding company still has not funded anything ;-) Moreover, this is something very far from the final results that we obtained, so I guess I could finally share it. Rather than a real research tool, this is more like a quick hack that I built up to show how we could use Information Gain to extract "interesting" words from a collection of documents, and term frequencies to show them in a cloud. 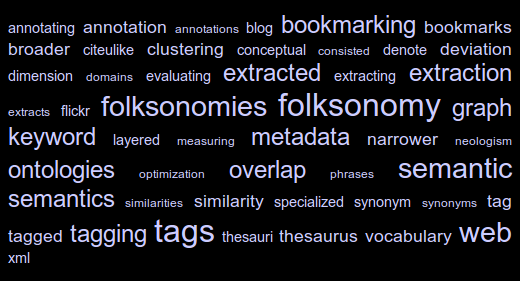 I have called it a "term cloud" because, even if it looks like the well-known tag clouds, it is not built up with tags but with terms that are automatically extracted from a corpus of documents. Figure 1: the term cloud built by rain out of a collection of documents about folksonomies. The tool is called "rain" as it is based on rainbow, an application built on top of the "bow" libraries that performs statistical text classification. The basic idea is that we use two sets of documents: the training set is used to instruct the system about what can be considered "common knowledge"; the test set is used to provide documents about the specific domain of knowledge we are interested in. The result is that the words which more likely discriminate the test set from the training one are selected, and their occurrences are used to build the final cloud. here you can find an "all inclusive" version of the script. It is much bigger but it provides: the ".deb" file to install rainbow (don't be frightened by its release date, it still works with Ubuntu Maverick! ), and a training set built by collecting all the posts from the "20_newsgroups" data set. How can I run the rain tool? I know this is not a recent paper (it has been presented in May), but I am slowly doing a recap of what I have done during the last year and this is one of the updates you might have missed. "GVIS: A framework for graphical mashups of heterogeneous sources to support data interpretation", by Luca Mazzola, me, and Riccardo Mazza, is the first paper (and definitely not the last, as I have already written another!) with Luca, and it has been a great fun for me. We had a chance to merge our works (his modular architecture and my semantic models and tools) to obtain something new, that is the visualization of a user profile based on her browsing history and tags retrieved from Delicious. Curious about it? You can find the document here (local copy: here) and the slides of Luca's presentation here.